Roberto, a Latino-American freshman at San Rafael High school in Marin County, California, was not permitted to read his anti-war speech at the student assembly commemorating the anniversary of 911. He was threatened with expulsion for handing out copies to other students. Later his school club materials were confiscated. In spite of interventions by the Human Rights Commission, he continues to be harassed at school. The school cannot figure out that he has civil rights, nor that someone who writes like this is clearly not learning disabled. On September 11, 2002, San Rafael High School in Marin County, north of San Francisco, scheduled an assembly for students to present talks to commemorate the anniversary. Roberto, a fourteen-year-old freshman, prepared the following speech. The person in charge told him he could not present it, saying it was "too political" and "we are only here to honor Americans." So Roberto passed out copies of his censored speech to the other students. The next day the principal called him into the office and said that if he passed out any more papers he would be thrown out of school. The vice principal said to him, "You are only a special education student and you cannot change the world. You have to do things that you're capable of doing and this is way out of your capabilities." Then on Tuesday September 24th the school had "club rush," where clubs set up tables to present their materials. Roberto had been approved and had a table set up in the back. Other students were enthusiastically gathered around his table and several dozen signed up. But at the end of lunch, the principals, with security guards, came and confiscated all the material: literature, signup sheets, and several students' backpacks. Roberto was called rude and defiant. His cause has been taken up by the Marin Peace and Justice Coalition (415) 721-2844, which has started a "futures" committee for youth issues. They called George Pegelow, a county human rights commissioner and ACLU member. They, along with Roberto and his father, met with the school to remind them that "there is a constitution" in this country and that students are "citizens of the USA with free speech rights." The school defended their actions with arguments of "procedural problems." It is expected that the school will back down, but Roberto's experiences illustrate several endemic problems in the school system: it is not only yet another case of censorship of high school student voices and diminished rights of persons under eighteen, but also – why is such an obviously literate and creative student being tracked into special education? (That means he's allegedly "learning disabled.") Could this be an illustration of an institutionalized problem in one of the richest, whitest counties in the United States? How many other children of immigrants, African Americans, or Native Americans are caught in this machine? Perhaps with a future in the military instead of the university. Who is steering this ship? Roberto himself, with great confidence and style, is moving forward. 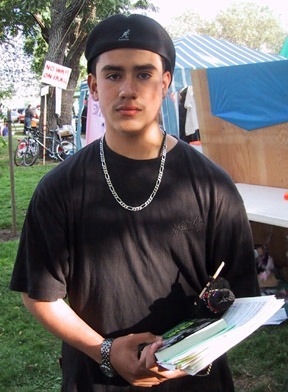 He has been interviewed on KPFA radio's "La Onda Bajita" and "La Raza Chronicles." He has made several presentations in conjunction with the upcoming Mill Valley Film Festival and is working on a video for it. Nada más de Sal si Puede pero - ¡Si se puede! Roberto's speech for 9/11/02: NOT IN MY NAME. Who am I, who are you, why are we here today in this assembly? Today is September 11th, we are Americans, yes I am American but I am sad – really sad to say that too often I feel ashamed to say that I am. I feel more like a victim of this country than a child of it – and I know that many of you feel the same. I think it is time we do things to be proud to be American. Today as we remember the tragedy, the many lives that were lost one year ago on this day, let us think about how we can not only honor their lives, but how we can stop ourselves and the way we live from causing another September 11th from happening again anywhere in the world. Right now, as we speak, our nation is preparing to go to war. War – hurt – pain – suffering – murder – unhappiness – hell on earth, in my name, your name? No! Some of us here today may have lost a mother, a brother, an aunt, or a father last year – and even if you did not I am sure that you were shocked, terrified, or saddened by the pain, the death, and the size of the destruction in New York. But have you stopped to think about the shocking pain, the terrible deaths, and the sadness of the destruction that happened in Afghanistan? Have you stopped to think about the children in Afghanistan or in Iraq who have lost mothers, brothers, aunts, or fathers because of retaliation by the United States? Is this the way that we remember our loved ones – is this the way we honor the dead, by making life hell not only for others who are living but also for ourselves, by taking the lives of others and it comes back to us in violence that takes our lives? Isn't it time we end this destructive cycle? Let us not be blind to the facts. We are in a war that is not meant to make this world a safer place to live, a world where people can live in peace with their neighbors without worrying about how to protect them self from them. In just one year hate crimes have increased, there is not only unrest in the Middle East, Latin America, and China, but there is unrest in America. Is more war, more death, and more pain going to help – NO. We are supporting a war for cheap oil, for Afghanistan's opium, and for the heroin drug trade, messed up by the underhanded deals of the CIA. And I say... not in my name. We are being told that we must retaliate – we must find someone to blame, someone to kill, but I say... not in my name. What does it really mean to be an American now, to display our stars and stripes – freedom, liberty, equality – really? Really – for whom, not even for me and certainly not for our fellow human beings in Iraq or Afghanistan. What the flag means right now is that I support the war, that I support death and pain, tears and suffering, cheap oil at any cost to human lives, and hate crimes. It means that I support a war that is based on economics. That is not what I want my flag to represent, can I please be proud to be American, can we please... STOP – because all of this is NOT IN MY NAME ... AND Not in your name either. I want to be proud to say that I am American – and I know you do too, so think about it and let's do what we can do to change what it means to be American. So that one day, people all around the world can honestly say that we are not only proud to be born in USA but we are also proud to be a citizen of the world, human beings, a part of this awesome thing called life. Thank you... Good Morning MY FELLOW HUMAN BEINGS.